Yes, gripping off can often be that stupid, but, and I say this from experience, if you are the one who is on the receiving end it really can get to you. Of course, the more you show that the gripping off is getting to you the more gripping off occurs in a positive-feedback loop that grows until someone ends up with broken optics. There are, of course, some things that make gripping off better than usual. Things like a person just missed the bird by moments, or the bird would have been a lifer, or everyone and their mothers have seen the bird. What matters the most, though, is that a person who wanted to see a bird didn’t and someone else did. Where does the term come from? The exact origins are shrouded in mystery but the term comes to birding from the British who, it must be said, do more than their fair share to enrich the birding lexicon. A slang dictionary defines the term as “angrily disappointed,” which is as accurate a definition for which one could hope. What does this have to do with anything? Well, dear reader, you may have heard of the Ivory Gull that birders have been seeing (and being seen with) in Cape May, New Jersey? 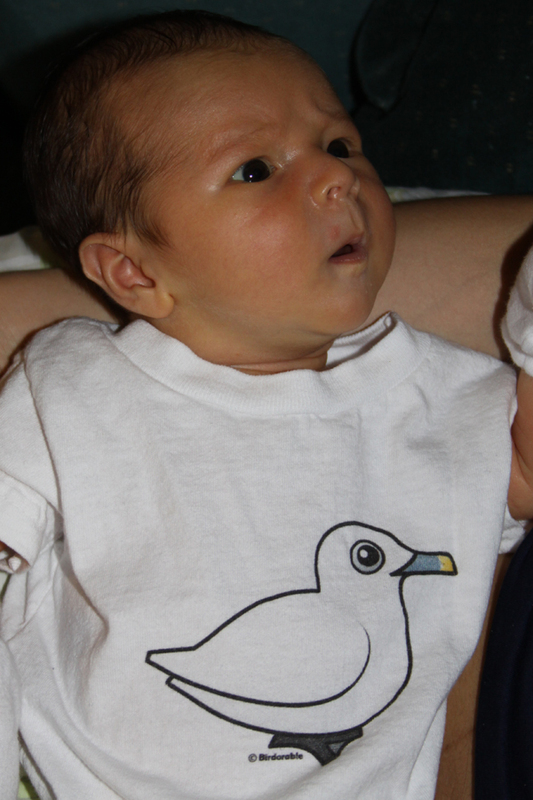 Yeah, I heard of the bird too, but, seeing as the adorable Desmond came into the world when the gull showed up there was no way I was going to be twitching the Ivory Gull. It’s not that I really minded missing the bird, having seen an Ivory Gull before, and, besides, having a kid beats the heck out of seeing a bird anyway. But, still, an Ivory Gull! So of course I was jealous when friends, like Patrick from The Hawk Owl’s Nest, got great looks at the gull, but, well, life goes on, right? Does little Desmond like his new outfit? You be the judge! 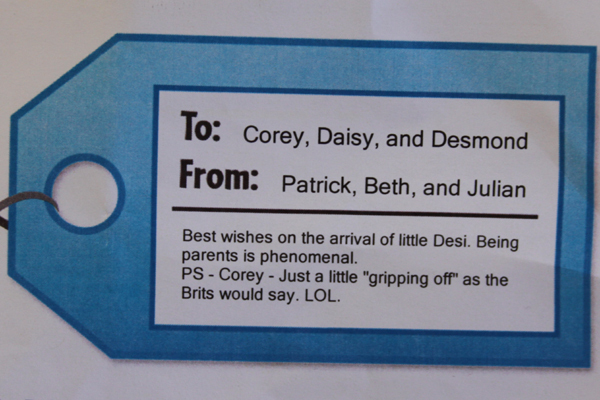 Patrick’s gift is absolutely adorable – uh, birdorable – on several levels. First of all, the shirt itself is cool however, and more importantly, Desmond is adorable in his own right. Hooray for Patrick, Beth and Julian! Of course, they will now have to get Desi onesies and t-shirts of increasing size as he grows, so you will not forget that you (and Desi) missed that absolutely beautiful bird (but not as beautiful as Desi). If I had a dime for every time, you Mr. Finger, were guilty of this, well I’d be a rich man. And yes Desi is adorable. @Patrick: this shirt and the story behind it is AMAZING!!! 🙂 You’re a star!!!! Glad to be of service! HAHAHA! He’s a cute little guy. Must be from the mother’s side. Thanks to Amy and the Birdorable crew for taking my special request. Desi is obviously the center of attention here and the shirt is way cool. Congrats Corey and thanks Patrick for bringing Corey to write such an interesting post. I actually never heard of “gripping off.” Those Brits! You know, when I sent the shirt, I thought you hadn’t seen one at all. I think I was mixing up you and MIke, who I believe missed the Piermont bird. Oh well, it was still fun.